This is one of those recipes that you will look at and think "nah, I'll just buy them." But let me tell you - you are missing out! These are truly the BEST SWEET PICKLES OF ALL TIME!!! Wash cucumbers and cut off the ends. Slice crosswise into 1/4 inch slices. Toss in a large bowl with the salt and onion slices. Cover with about 4 to 6 cups of ice cubes and let sit for 4 hours or refrigerate overnight. Prepare the bowling water bath. Add water to a large canner with rack and heat to about 180 degrees. The water should be high enough to be about 1 inch higher than the filled jars. Wash jars thoroughly and heat water in a small saucepan; put the lids in the saucepan and bring to an almost boil. Lower heat to very low to keep the lids hot. Drain the cucumber mixture. In a large pot over medium heat, combine the other ingredients and bring to a boil. 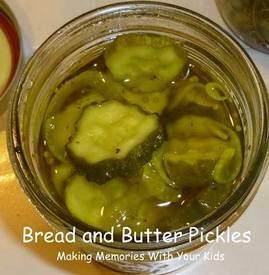 With a slotted spoon gently fill jars with the cucumbers. Ladle the liquid into jars, dividing equally among the jars. With a clean cloth, wipe any liquid off around the mouth of the jars and put lids on. Adjust the screw on lids firmly but don't over tighten. Place filled jars in the boiling water bath, filling with more boiling water if needed to cover the jars. Bring the water to a boil. Cover and boil for 10 minutes. Lift the jars out of the water and place on a rack to cool.